1) Perfect strength-to-weight ratio: Shopping bags needs to be strong enough to hold heavy groceries along with being lightweight. Canvas is manufactured using a knitting style known as plain weave. This particular knitting technique produces a fabric which is known to be notoriously strong and can provide as much strength as materials, which tend to be much heavier. So if you pack your custom cotton canvas bag full of canned food it will be able to handle them. 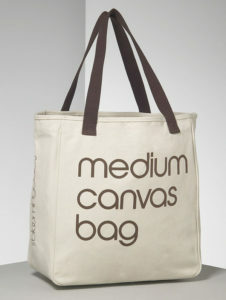 2) Durability: Canvas is manufactured from cotton which is known as a durable fabric. It is the same plain weave, which makes canvas both strong & durable. A cotton canvas bag can last for decades, without any tear or wear. 3) Washable: Cotton & canvas requires no special care. It can be tossed in the washing machine along with the rest of the laundry without fabric damage. This is especially important if you plan to use these bags for grocery shopping. Food leaks and stains can be easily washed out, thereby eliminating the transfer of bacteria as the bag is reused on a subsequent shopping trip. 4) Ideal for imprinting & promotional purpose: Cotton & canvas is excellent for imprinting because of its receptibility to ink transfer. It accepts color with ease, and ink sets on it without bleeding. Even after setting, the ink does not fade and flake or rubbing off and will stay put as it is when the bag is being washed. It’s the material when it comes to imprinting with a logo. 5) Natural: Canvas is made of cotton, which is a natural fiber from the cotton plant, therby making it hypo-allergenic and quite easy to produce. 6) Environmental: As it comes from a plant, cotton is a renewable resource. It is manufactured with low environmental impact and is recyclable. 7) Affordable: Canvas is known an economical fabric, which makes it highly affordable even for smaller businesses and advertisers. These bags range in size and weight and from simple to complex features. Simple, single-compartment styles are excellent for use as grocery bags. Complex styles, like those with zippers or extra compartments and pockets are best suited for use as beach bags or for carrying to school or work than a single-compartment ones. Additionally, custom canvas bags with gussets simply adds more space to the inside of the bag. It can be made to rest flat on the floor or ground.